❎ Not Verified | Awful airport. We went one terminal to another 4 times. Also seating in waiting area are made for only one people so you can't stretch at all. Passport control had only 3-4 desks for more than 600 people. Nobody speaks english. They change gates pretty often. No smoking area. 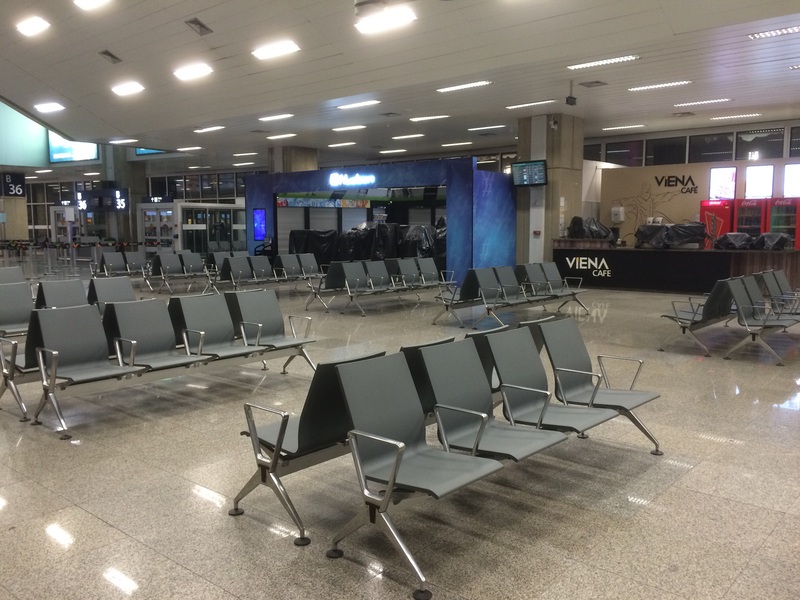 "terminal was quite clean and quiet"
Flew in and out of Rio Galeao airport in October. Terminal was quite clean and quiet, and quite a lot of shops, but not too many, which is neat. The walking was a lot though, and there were no conveyor belts to speed from the security to my gate (all the way at the other end of the airport). This is one of two points that could be improved. The other one is is that some employes doing reaserch and statistics about client satisfaction were walking aroud the gates to get info. No problem there. But there are far too many. I got interupted almost every 10 minutes, and I think that the airport can/could relax on that. An otherwise great airport. Much better now that they inaugurated the new pier. More shops, restaurants (although some are overpriced) and seats available. Good staff and cleanliness.The restrooms are very good and clean. One problem is the distances between check-in and boarding. 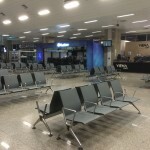 Rio De Janeiro is a good aiirport but was very crowded during the Olympics. The new terminal is awesome, but GOL VIP lounge is poor - the Plaza Premium Lounge is better. The duty free is good, but overpriced. Customs and immigration officers are quite sympathetic, and the airport is clean. This must be the worst international airport I've flown out of. Much worse than São Paulo. We arrived at 4.30am for our 6.30am TAM flight to find a long queue for check in with only one person working and no priority check in queue at all. Once through most of the very small rubbishy shops were closed. Couldn't even get a coffee. The lounge was also closed. The seating is uncomfortable and impossible to sleep on, which I really noticed given my kids had to be up at 3.30am to get there. Power points are not easy to find and I couldn't even by a charge cable for my phone. I could go on. By far the worst airport I've ever experienced. Nowhere to get a meal, very few shops and the main duty free shop prices everything in US dollars. Not much use for someone wanting to use their remaining Brazilian Reals. You could, in fact, use them but had to convert the prices to see how overpriced things were and if you could afford it. The few other small shops were all closing during the evening so missed out on trade. Had to queue approx 1hr 50mins for a midnight flight even though it appeared that it was the only flight due to depart. Only 4 check in desks open which became effectively 2 when two sets of people were there for over 20 minutes. No attempt was made to open more desks by the time we'd checked in the shops were closing. Not a good end to a holiday. On Arrival In Brazil, they do not have any Customs and Immigration officer. The border control is being handled by the Federal Police. No questions was asked and they just verified my visa and then I was welcomed to Brazil. The airport itself appears to be old but I find it clean. There is a free wifi at the airport which is always a big plus. Just outside the International arrival hall was an information desk and the guy who was there speaks really good English so it was not a problem asking for direction. There's many choices to go to town but we opted for Taxi as there were 4 of us and it will be cheaper that way. There's an Airport Bus that stops to the hotel zone in Copacabana and Ipanema or they have the Local Public Transport Bus as well but was told that you will need to make 2 transfer as there's no direct service to GIG airport to Copa. Our taxi driver spoke a good English and he was telling us the sights as we pass them. Taxi costs us about BRL60 (USD 15) which is really cheap and that's including the BRL2 charge for each bag (for big size only..no charge for small carry on bag). On Departure ,GIG utilizes the use of mobile Phone apps for boarding which I find very convenient. The signage was not very clear so we got lost a little bit on the way to the boarding gate. The big arrival/departure flight information monitor outside security does not have any gate information, once you entered security, then the monitor has the boarding gate. Our Boarding Pass did not have the gate number either which I found really odd. Security line was a breeze. However, I am not sure if Brazil follows the same rule in regards to liquid. Me and my friends had a bottled water in our carry on bags and we forgot to take it out before security. We were never asked about it and they just let us go without any question. Our flight was around noon and the airport was quiet as there's not very many flight going on at that time so check in, baggage drop, and security only took us about 15 min altogether. Again, departure area looks old but clean. Washrooms are old style as well but again, clean. Once inside, there's a choices for food and drinks. Prices are reasonable for airport pricing. However, the souvenir shops was expensive. The same time we bought at the mall or in the Streets of Copacabana as Triple the cost inside the airport so but your souvenir outside. I like the boarding area set-up for each gate. They have stanchions and signage of your boarding zone so you know where to line up when they call your turn. it was really organize. Airport paging system was good and you can hear the announcement loud and clear. This international airport is a bad joke. Everything is old nothing works. The staff in unprofessional nobody speaks English not even the airport staff! There is only one duty free shop with no selection of products and the few things are completely overpriced. Absolutely a shame. This is most probably the worst International Airport I have had the misfortune to pass through. I was shocked at how bad it is. On arrival we landed evening time and waited nearly 2 hours at immigration as there were 6 European flights all in around the same time - Chaos! No AC anywhere. Finally got my case and made my way to the exit where we were met by a driver. Departure was a different story. On arrival at T1 we were met with a shoe shine boy outside who hassled us for money. Check in security and immigration passed relatively easy however when you are airside there is absolutely nothing inside apart from two over priced cafes and an even more over priced Duty Free shop. The building is falling apart and we couldn't see any renovations being done for the World Cup. Also no AC and the building stank. 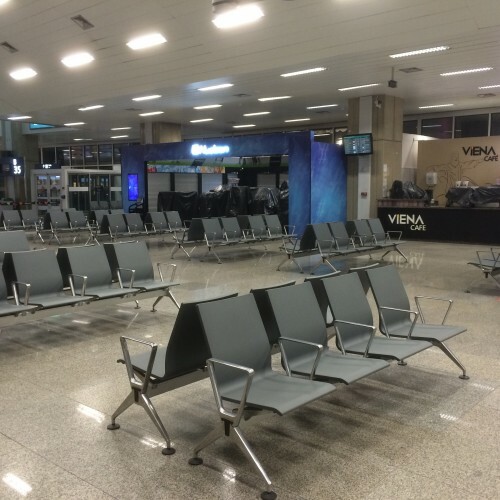 I suspect serious problems leading up to and during the World Cup and I pity any tourist or fan going to Rio (and possibly onwards) in the next 12 to 18 months as the airport is simply not capable of handling general passengers let alone anyone else. If I ever go back to Brasil I would avoid GIG at all costs. Arrived in Rio at 7pm from London and took a taxi. Don't even bother with a bus. Couldn't find one. Not a good idea to take a bus that time of night anyway. The airport is very third rate and this was confirmed when I returned 7 days later to catch an internal flight. Automated check-in which you had to do was hell. They don't do counter check in. You're not allowed to check in your bags until you've done automated check-in. 4 days later I was back at the airport to take a flight to London. Internal arrivals and international flights is a good ten minutes walk. The whole place is under construction so it's a building site to say the least. I was at the check- in desk 4 hours before take off no cafes nothing. There was nothing to ease your waiting. Business desk opened as stated but economy wasn't going anywhere. After check in tried to find the business lounge through the building site. When I eventually found it what an utter disappointment and judging from the faces in the lounge there was a universal agreement. The lounge is not fit for purpose. Tiny and cramped. There were a couple of showers crammed into the little lounge and using them wasn't a nice experience. Door being rattled the whole time with people trying to get in to use the toilet. I saw successive people trying to use the mains power for their laptop and surprise surprise hardly any of the sockets worked. Food was very much a token affair. I've never left a business lounge to wait at the boarding gate an hour and a half before take off before but that was better than sitting in that awful lounge. The departure gate waiting area was even worse. Another building site. Silly me to expect world class airport amenities for a city that's to host world cup and the Olympics. So let down. My advise go after the Olympics and maybe it's sorted by then.